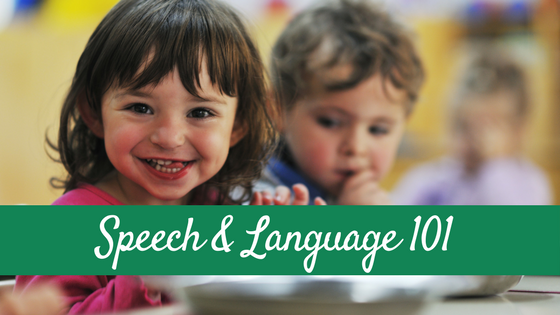 Welcome to Your Child’s Speech and Language Development: 6-12 months! This little person has now been in your lives for half a year! Whether this is your first baby or your 10th, no doubt this little guy has changed your world for the better! 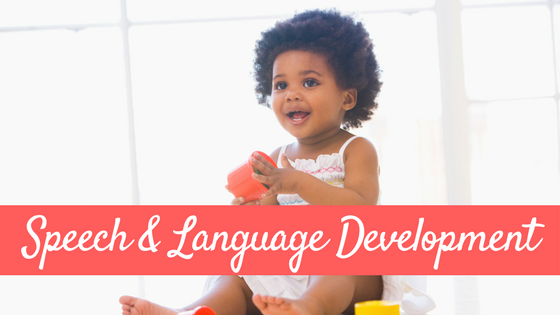 You’ve been busy watching your little one’s moves, interpreting them, and responding: Resulting in your child learning about how to communicate. You’ve been busy speaking to him using parentese (short phrases, emphasizing important words, higher pitched tone, exaggerated facial expressions…you know the crazy lady…or man…walking through Target that you think is talking to herself until you realize there is a baby in the cart? YUP that’s YOU!) So how should his speech, language and communication skills be developing these next 6 months? Around 6-9 months your little one will start to turn his head in the directions of new sounds and may begin responding to his own name! Not only that, but soon after your little guy should start recognizing and responding to some common words and phrases like ball, dog, cat, bye bye, etc. 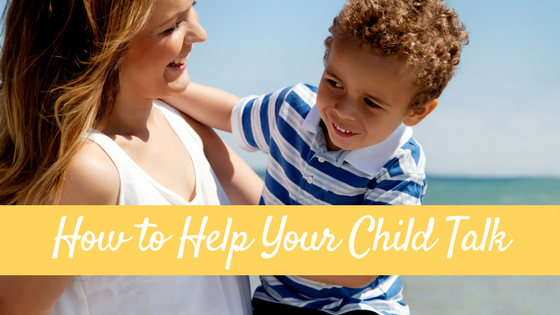 For example, your child may crawl over to a ball in response to you talking about a ball or look in the direction of the door when you mention going bye-bye. This is the time that he will really begin to like and participate in little social games like peek-a-boo and patty cake. Remember how in my last post I mentioned that is is believed that infants from birth to around 6 months don’t communicate with intent? Well that is about to change! Your little guy now has the cognitive ability to understand cause-effect relationships and he is beginning to play with this new concept to communicate. 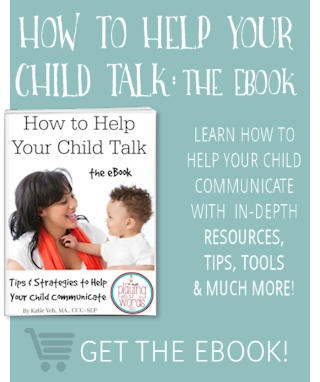 You may see your little guy use facial expressions, eye gaze, grunts, babbles, gestures, etc to start to communicate with intent. Your baby may begin gesturing toward objects he wants, like that ball or bottle out of his reach with the intent to get you to give it to him. And another big milestone that happens around now is that your little guy will begin to initiate joint attention or joint reference with you. Joint attention refers to when two people are sharing a moment together while also sharing focus on an outside item. That is, you and your child are both attending to the same object and you each are aware that the other is attending to that same object. You have been busy (unknowingly) teaching your little guy how to do this in the first 6 months of his life as you chattered on and on while visually referencing different objects like dogs, toys, cars, food, and so on. Most likely your little guy was starting to respond to your attempts at joint attention by looking at the items you were referencing but now he will begin to initiate joint attention with you. He may babble or screech when he sees your family cat walk in the room, then look from you to the cat as if saying “Hey mom, look! It’s the cat!” He may grunt and reach towards the blocks on the floor and then look from the blocks, to you, and back at the blocks as if to say “Mom, I’d really love to play with those right now.” He is communicating to you with his eye gaze! The last 3 months your little guy has been starting to really communicate with intent and right around now he is about to embark on an important cognitive and communication milestone: Object Permanence. Up until around now, when your family cat left the room, the cat ceased to exist for your infant. When you removed that toy from his view, he didn’t know that it was just put away in the basket he thought it no longer existed. The concept that objects and people in this world exist even when they are no longer able to be seen, heard, or touched is referred to as object permanence and this is a very important cognitive skill that emerges over time generally around 8-12 months of age or so. Jean Piaget, a Swiss psychologist who studied this concept, along with many others, believed that this milestone is fundamental to language learning. So around this time, you may find that your infant is starting to realize that when you cover a toy with a blanket, that the toy has not disappeared but can be retrieved by simply removing the blanket. It is at this time that games like peek-a-boo will really start to be fun for your little one because he understands that your face is behind your hands and that when you move your hands he will see your face again! So why is this so important for language learning? All language is based on some type of symbolic system. In spoken language the symbols are the spoken words. In written language the symbols are the written words on the page. In Sign Language, the symbols are the different hand-shapes. All these symbols correspond to things, people, actions, etc. Now that your infant understands that things are always “there” somewhere, he will begin to understand that he can use these symbols (words) to reference them, even when he doesn’t see them! For example, your child requesting a cup of milk while the milk and cup are out of view, requires the knowledge that the cup and milk exist somewhere. This concept that things just don’t just “disappear” once we can’t see them anymore is a huge milestone! 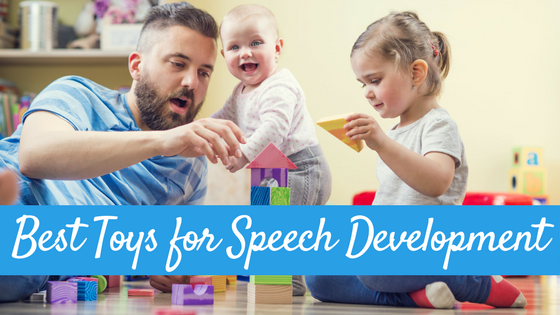 Your little guy is also starting to really recognize and respond to more and more of your language. He is starting to link together that when you say “dog” that a four footed, hairy animal that barks will be somewhere in his view. He is even starting to follow simple requests and questions like “come here” or “want more?” He will start to respond to “no” (when he is in the mood 😉 )He will begin to use gestures and vocalizations to indicate his wants and needs more and more like putting his arms up to indicate that he wants to be picked up. He will continue to laugh with others and in his play and may like to play and smile at himself in a mirror. And his speech? I told you it was going to get exciting! Those first sounds and babbles are now starting to resemble adult speech! These new babbles will now almost sound like real words and he will speak with intonation just like we do! We call this jargon (or in my house, we call it speaking alien 😉 ) He may begin to really imitate some of the words you say and at the end of this time period he may…. Yes, you’ve been anxiously awaiting this moment for a long time and sometime around now you should be hearing his sweet voice using real words. It is such an exiting time hearing those first sweet words. All this work you both have been doing the last year is starting to pay off and soon you won’t be able to get him to stop taking! But how does he move from those first words to phrases and sentences? 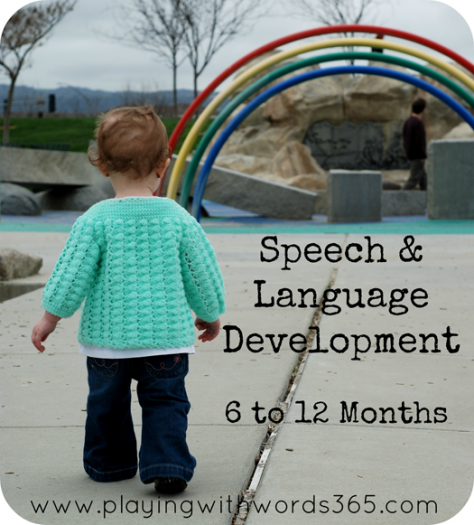 Join us next Wednesday for the next installment: Speech and Language Development 12-18 months to learn more! hi there just saw this post. 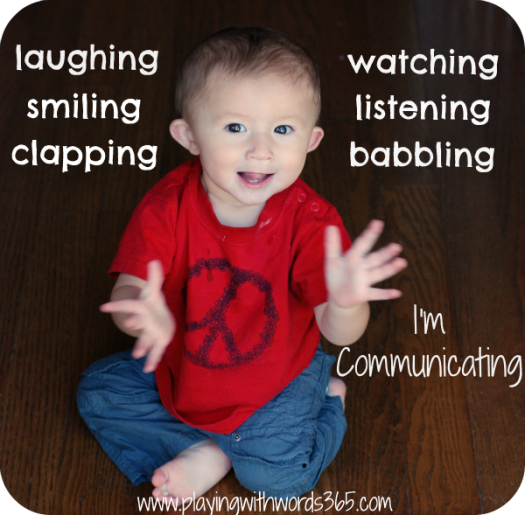 i had just posted something along this lines: about how to encourage communication in 6-12 mo old babies! love the photos. 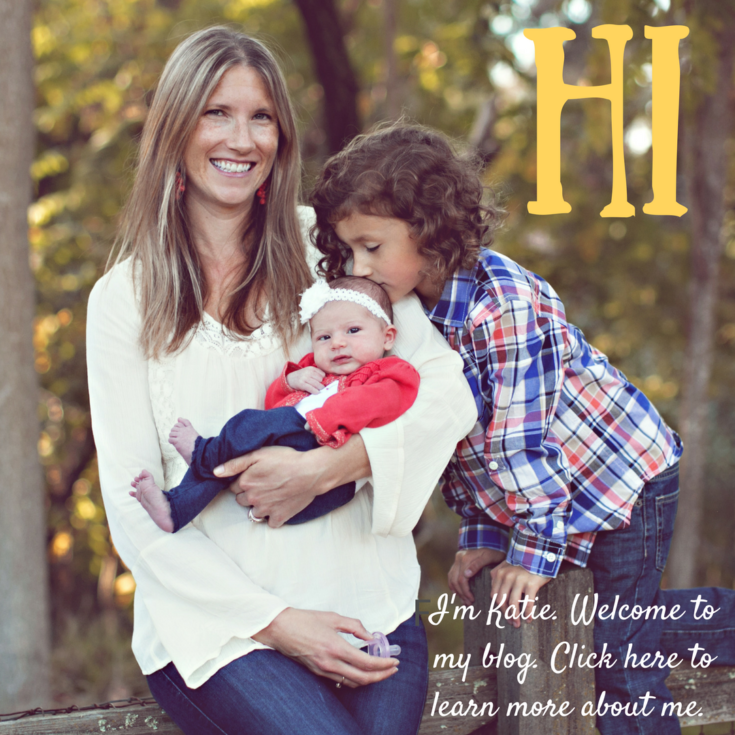 i’ve also used one of your other activities in my speech groups before and the kids loved it! meant to do a thank you post earlier; probably soon. thanks for sharing.